ARRESTING DEVELOPMENT Cheadle and Gleeson make unlikely allies in McDonagh’s inspired cop comedy. It’s a shame Brendan Gleeson is pretty much universally acknowledged to be Ireland’s finest living actor, because his Sgt. Gerry Boyle would have made one hell of a breakthrough role. A County Galway cop with a fondness for liquor, ladies of the evening and LSD, he’s one of the most brilliantly original movie creations in recent memory. The character is the inspiration of first-time writer-director John Michael McDonagh (older brother of In Bruges writer-director Martin McDonagh). Which makes you wonder what growing up in the McDonagh household must have been like, given the fraternal filmmakers’ penchant for black humor, nihilistic violence and industrial-strength profanity. Something tells me there weren’t a lot of Cub Scout meetings in the rumpus room. The idea is, Boyle lone-wolfs it through life in sleepy Connemara, a place where DUI and jaywalking infractions in the same month would constitute a crime wave. At least until a trio of big-time drug traffickers arrives on the scene to receive a boatload of coke, and the FBI, which has been tracking the shipment, dispatches agent Wendell Everett (Don Cheadle) to coordinate local law-enforcement efforts. Boyle does not take well to being coordinated, much less by a straight-arrow, by-the-book American. He makes an art form of yanking Everett’s chain — for example, raising his hand at an initial briefing and asking in mock innocence, “I t’ought only black boys was drug smugglers?” He’s not a bigot, but a master of messing with people’s minds, and it’s hilarious to watch the disbelieving G-man’s reactions. Equally entertaining is the blue-ribbon banter among the bad guys. An instant classic is the scene in which the three criminals — played colorfully by Liam Cunningham, David Wilmot and Mark Strong — motor through the Irish night debating the relative merits of Nietzsche and Bertrand Russell. It’s like something Quentin Tarantino might dream up after a few double Jamesons. Only loopier and with a lighter touch. McDonagh breathes new life into the tired mismatched-cop formula, toying with the traditions of the genre, trying things never tried in it before (am I forgetting another movie that’s set in rural Galway and features a spaghetti-Western score?) and just generally turning it inside out. He knows what to keep and what to toss, and the result is a surpassingly good time with an unhinged twist around every corner. As ripping a yarn as this proves to be, story takes a backseat here to verbal pyrotechnics and meaty performances. The dialogue is a marvel, a fast-flying feast for the ears. I pity the fool who finishes his 34-ounce “small” Pepsi at the cinema and makes for the men’s room. Timeless talk is likely to be missed in those few moments. The scene in which Cunningham’s crime lord and the guard he’s trying unsuccessfully to bribe mull the mystery of just what it was Billie Joe threw off the Tallahatchie Bridge is worth the price of admission by itself. But, as I say, the main attraction is Gleeson’s magnificent, multilayered turn as the Irish crime fighter. 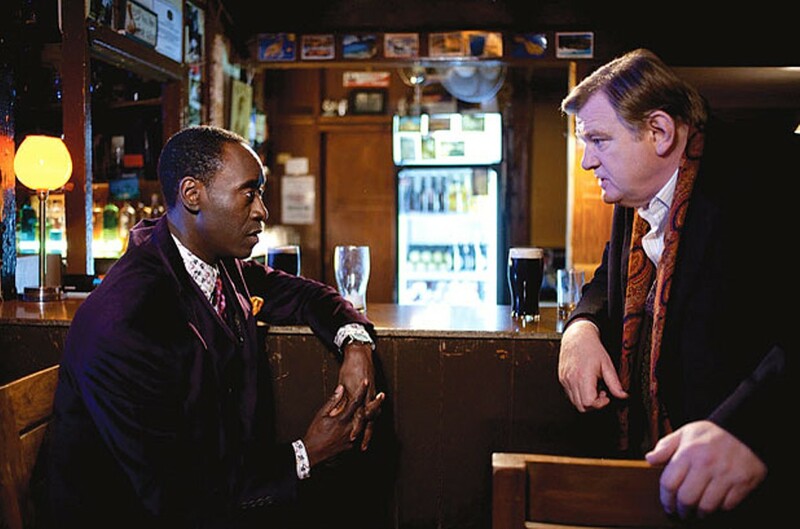 Cheadle is a great actor and makes a great straight man, but this is Gleeson’s film from first frame to last. And, while he plays an enforcer of the law, he totally steals the show. * Running time: 96 min.